Think of this list below as an educational circle of life, of soul-mind-heart-body, all of them interacting simultaneously, and not as a linear list of things to do--accomplish number one first, then do the next one, etc. Patanjali's list (written around 2000 years ago—was an oral history long before that, about 5,000 year's maybe) is about training and disciplining the often dormant, other side of our human mind-instrument, the meditative mind, which is not linear. The linear thinking mind—in contrast to the meditative mind—has two basic learning skills: one explores, memorizes, and learns academic and vocational skills like, carpentry, law, math, history, culture, philosophy, psychology, science, sociology, literature, languages—our academic, school-learning mind. The second basic function of the thinking mind, the psychological mind—fragments our psychological thoughts of ego, self, and other from the illusions of the past and the projection(s) of the unknown future—both unreal. The understanding and discipline in the list below is essentially designed for the development of meditation, the observer, the meditator. The 8 limb list, below, is about disciplining the psychological part of the mind. The ancient master, Swatmarama, said that to approach these human psychological challenges and disciplines through the mind-brain is useless. Very few people can do that. Instead, he said, "Discipline the mind through the body." Thus he wrote: "Hatha Yoga Pradipika," meaning, "Light On Hatha Yoga," and brought Asana and Pranayama practice to the world of his time in the Sanskrit language, sometime between 700-1499 CE (current era). (Hatha is sun/moon, yin/yang, balance; asana & pranayama practice basically.) One may enter into and experience the 8 limbs—aware of breath, posture, one's actions, meditation, for instance—at all times, in life's circular interaction as a harmonious whole. Though, in Sanskrit, Patanjali wrote the 8 limbs as you see below, he did not mean for this list to be a sequential, linear list of things, as I said before, "do this first, then, do that." The 8 disciplines listed below, in Patanjali's system of the "Yoga Sutra" from book 2:29, are simultaneous disciplines, and are better understood as an interactive whole system, like our heart and lungs and other organs. Yoga is the understanding of the whirlwinds of the mind, which is a definition of [the indefinable] meditation. Thus, Yoga is meditation. Yoga is the understanding of the thinking mind, so that our other instrument, the often dormant meditative mind can become active and surface effortlessly, in order for the mind to be free of thought. Patanjali refers to changing, conflicting, and fluctuating thoughts as the whirling winds of consciousness. * Yama Social disciplines, concerning ones' dealings with society and the world (see below). * Niyama Personal disciplines (see below). * Asana Seat. A position comfortably held; an exercise (also: a pose, a posture, a position of the body). * Pranayama Breath awareness (prana, life-force; and ayama, extension). * Pratyahara Moderation and deepening of the senses. See Lu's essay on pratyahara. * Dharana Focus, attention, being-thereÑbeing here now. Concentration is often used as the translation of dharana. This word is inappropriately understood in English. Focus and attention is not a cutting off of consciousness to one point only; attention is not an exclusionary process like concentration isÑso, focused attention, paying attention, observing, seeing, watching, proceeds the meditative mind's ability to operateÑthink "be here now." * Samadhi 7 seconds of meditation/dhyana; ecstasy, forgetting the state of meditation which precedes it. A blossoming of pure Awareness. These last states are easily accessible to the student, and not in the future. Right communication (truth, honesty) through speech, writings, gesture, and actions. The ability to resist a desire for that which does not belong to us; non covetousness. Ability to accept only what is appropriate, or non-greediness. Contentment (the ability to be comfortable with what we have and do not have). The removal of impurities in our physical and mental systems through the maintenance of sleep, exercise, nutrition, work and relaxation (leisure). It is important to realize yoga is balance. 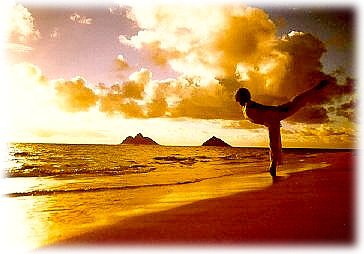 Yoga helps to harmonize and balance these important elements of life. Work is only a part of this whole, not the main act. Study and review of the self. Chief among these is to know the self and one will know the world. All of the great mysteries unfold in the mirror of our own being. A recognition and awareness of the Universal Life Force which dwells in every atom of the Universe.